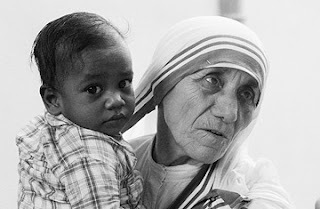 Mother Teresa, what a hero! And to think she was having "dark nights of the soul" as she lived in the light of God's favor. I was checking the news for the day to just make sure I wasn't missing anything going on in our world and I came across this TOP story, Mother Teresa's Crisis of Faith. Basically, there are letters she wrote that reveal a "crisis of faith" of sorts. Times she felt alone, all alone, no God, no Faith, and miserable. Of course it grabbed me by the soul and I read. Wow! I have not even allowed time to process this "news", but I am thinking; How does this happen? How can I avoid it? Is it avoidable? Why? These are all great questions we must ask ourselves. And I can only hypothesise to the reasons she faced these dark nights of the soul. But, I will tell you what has caused me to have dark nights of the soul. 1.) God led me there - just as the spirit led Jesus into the wilderness, I believe He leads us there for a purpose as well. Ultimately for my good, and my growth. 2.) I led myself there - I have made decisions that were bad, unfruitful, and dark. And the result is I strayed from the path God had for me. My choices! When I chose to speed (which I never do - ha ha!) I put myself in a situation to get a ticket! It's not always things I choose TO DO, but also in the things I chose NOT TO DO. For example, when I chose NOT to talk with God, and NOT read my Bible - I chose darkness. My mind becomes clouded, and when I stay fresh with my relationship with God it clears the fog. 3.) Evil led me there - Tempation. Just as David (in the Bible) was tempted to have an affair with Bathseiba, we are tempted to do bad. This leads to dark times. 4.) (Like #2) I chose to sacrifice when God has not asked me too (1 Samuel 15:22 "...Obedience is better than sacrifice...") I think sometimes we make assumptions about what it is to be holy, or a saint, or a believer, or a person of faith, or a Christian. Like in the movie, The DaVinci Code when Silas would punish himself for his sins by beating himself. I think we do this, honestly I do this sometimes. I don't beat myself, but a mildler type of beating. I make extreme sacrifices that God has not asked me to make, but I do it to punish myself, or make myself feel more holy. Now, please understand I think we NEED to sacrifice much more than we do many times (especially in our spoiled rich culture), but we must always ask; is this something God is asking me to do, or is this me? The fruit of sacrifice is death, but the Fruit of obedience is life.